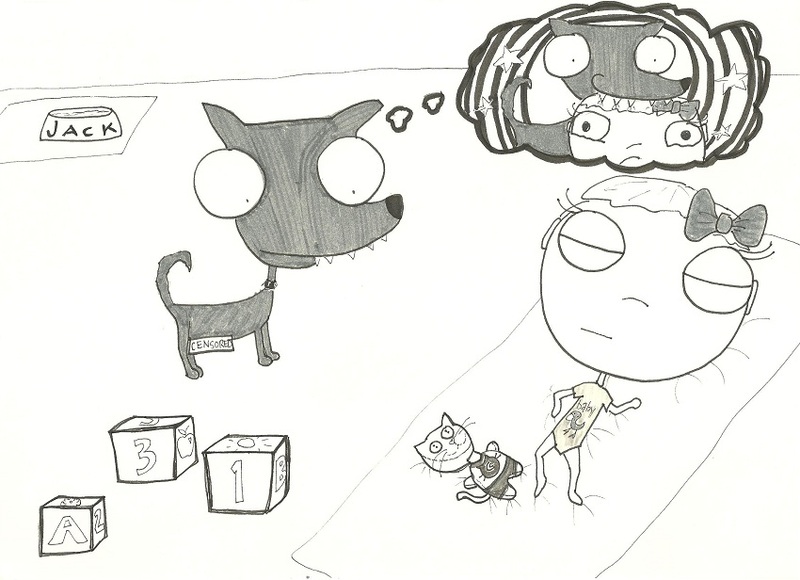 Bonus points if you can spot the "notacrazycatlady" shout-out in this cartoon! One of my best friends Emily just had a baby this winter. She’s the first of my close high school friends to have a baby so I’m excited to be “Aunt” Lindsay. Maybe I’ll just let her call me Aunt Notacrazycatlady. Either will do. In honor of this baby, here is a cartoon. Little baby Claire came up with Emily when I was visiting Ohio this spring. We stopped by Emily’s awesome parents to say hello and I got to meet their new little dog Jack, who they appropriately and lovingly (?) call simple Jack. I can only assume because he’s dumb. He also is a bit of a cantankerous little fellow and has issue with Claire. As in, he would like to eat here. So here is Jack, living out his fantasy while sweet little Claire slumbers on. Let’s hope this is the closest he ever comes to nomming on Claire. You may also notice the “censored” bar on Jack. Ahem….he might have had a little big problem that needed reducing and still isn’t quite under control. Gross. At least he’s a little dog. Could be worse. Libraries don’t like it when you keep their books.